The Param Vir Chakra (roughly, the “Wheel of the Ultimate Brave”) is India’s highest military decoration for gallantry during battle and is “awarded for rarest of the rare gallantry which is beyond the call of duty and which in normal life is considered impossible to do”. The medal is known for having one of the most stringent selection process of any military award in the world and 14 of the 24 total recipients were killed during the action that earned it. One such posthumous recipient was Yogendra Singh Yadav… The problem was that Yadav was very much alive and heard about his own heroic death while recovering in the hospital. Born in 1980 in the village of Aurangabad Ahir, Yadav was the son of former soldier who’d fought in the Indo-Pakistan wars as part of the Kumaon Regiment. Yadav, along with his brothers, would frequently spend evenings listening to their father’s war stories and tales of famous Indian military heroes. This instilled a deep sense of patriotism and duty in Yadav from a young age, so it was no surprise to his family when he decided to join the military at just 16 years old, joining the Grenadier Regiment. Yadav subsequently proved to be a formidable asset to the military, quickly rising through the ranks and eventually coming to serve with an elite commando unit of the 18 Grenadiers called the Ghatak’s- basically, elite shock troops tasked with being the first boots on the ground in any conflict. On May 3, 1999, Kashmiri and Pakistani militants managed to storm and take control of several strategic forts and bunkers along the border that had been left abandoned since the end of the war. This action prompted the start of what became known as the Kargil Conflict- a series of bloody confrontations between the two countries that lasted just over 3 months. One of the most strategically valuable points captured was a group of fortified hardpoints atop a 17,411 foot (5,307 m) tall mountain known colloquially as “Tiger Hill”, or officially as Point 4660. As the tallest peak in the Kargil region, Tiger Hill allowed the enemy soldiers to look down on the 56 Brigade’s headquarters, as well as watch the Srinagar-Leh highway for troop and supply movements. Unsurprisingly, the top Indian military brass demanded its immediate recapture at any cost- enter Yadav’s commando platoon, the 18 Grenadiers. The mission of the 18 Grenadiers (which has been called one of the most brazen ever attempted in open combat) was to scale an icy, 1000 foot near vertical section of the mountain and assault the 3 fortified bunkers atop it, while artillery bombardments distracted the combined Pakistani Kashmiri forces stationed in them. Yadav (who was just 19 years old at this point) wasted no time volunteering to climb the snow-covered peak unassisted and lead the assault. Yadav’s mission was to affix ropes to specific areas so that the rest of the near couple dozen 18 Grenadiers squad could follow him more quickly. Trained in both mountaineering and alpine warfare, Yadav was an exceptional climber and was reportedly able to scale half that section of the mountain in mere minutes- a feat that becomes all the more impressive when you realise this assault began at night (roughly 11pm local time) and the elevation in that area is approximately 17,000 feet (5,100 meters), meaning light and oxygen levels wouldn’t exactly have been ideal for such fast climbing. Unfortunately for Yadav, as he was closing on the top of the mountain, with his platoon now following closely behind, he was spotted and the enemy opened fire with machine-guns and rocket launchers. The initial volley killed Yadav’s commanding officer along with a few others of his squad, all of whom were either killed outright or who fell to their deaths. Clinging both metaphorically and quite literally to life, Yadav sustained three significant injuries while pushing himself to climb the rest of the way, taking two bullets to the shoulder and one to his groin in the process. Despite the injuries and being under heavy fire with little cover, he managed to make it to the first bunker, hurling a grenade into it and killing everyone inside, silencing the enemy fire from that position, allowing his squad to continue their ascent. Unfortunately for Yadav, the attention of the second enemy position was now directly on him and they opened fire on the young man, who was soon joined by two of his companions. Yadav then led this trio of death in charging into the storm of bullets and rockets being aimed at them, with Yadav ultimately managing to reach the enemy bunker. In the ensuing hand-to-hand melee in which he used his climbing ice axe as his primary weapon, he killed the four Pakistani soldiers manning the position. At this point, the surviving members of the 18 Grenadiers reached Yadav and were greeted to the sight of an extremely bloodied and injured young man surrounded by dead enemy soldiers. Remarkably, during his two headlong charges, Yadav had sustained a further 12 bullet wounds two “hand grenade wounds” and had his arm broken and nearly ripped from its socket by an explosion, leaving it hanging limply at his side. Yadav shrugged off these injuries (presumably metaphorically as literally shrugging would have been a tough act given the two bullet wounds to his shoulder) and used his belt to make a sling for his arm. Next, he pulled out his pistol and charged the third and final position. Rallied by Yadav’s bravery once again in the face of heavy, near point-blank fire, the rest of his squad followed and captured the final point. News of Yadav’s valor and total disregard for his own safety in the face of overwhelming opposition soon reached the military brass and he was immediately recommended for the prestigious Param Vir Chakra at the tender age of just 19 years old. Now, the Param Vir Chakra has one of the most robust selection process of any medal for heroism in the world, which is a particular point of pride for the Indian military. The medal isn’t just awarded for “everyday” gallantry- it is awarded for the “Most conspicuous bravery or some daring or pre-eminent act of valour or self-sacrifice, in the presence of the enemy, whether on land, at sea, or in the air”. Needless to say, it was a curious, and embarrassing thing, that they subsequently awarded Yadav the Param Vir Chakra posthumously, despite the fact that he was lying in a hospital bed at the time. Yes, not only had he sustained a body’s full of serious injuries, but he made it back down the mountain and to the base hospital. In fact, after the award announcement went out, it was Yadav’s young wife who subsequently notified the military brass at the base hospital that her husband was indeed alive and reasonably well all things considered. It is often claimed that the number of serious injuries Yadav sustained combined with his unbelievable actions were such that it was simply assumed he’d died before making it back to medical aid. However, the selection process for that award is far too rigorous to let such a thing slip normally. What actually happened is that in Yadav’s squad there was another soldier with the exact same name- Yogendra Singh Yadav – who did die during the battle. 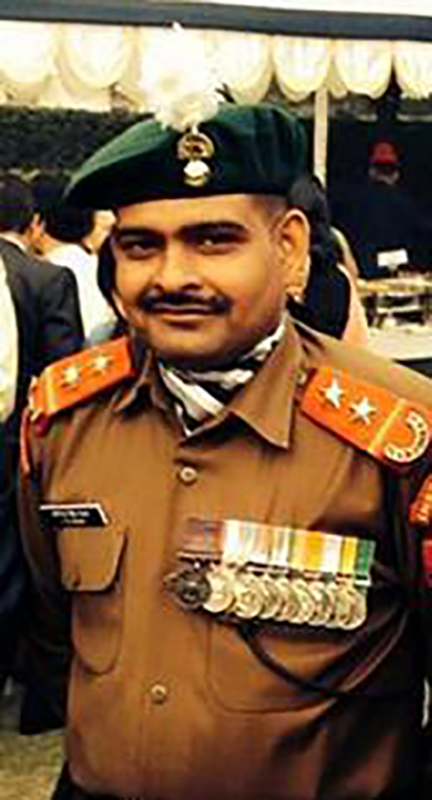 As a result, when the living Yadav was recommended for the Param Vir Chakra, officials attributed the remarkable actions of Yadav to that guy instead- whether because they simply assumed the Yadav who died must be the one who sustained all those injures and performed the unbelievable acts, or simply because nobody noticed there were two Yogendra Singh Yadav’s on the squad, isn’t clear. To further confuse things, it’s also noteworthy that the other Yadav was among the first to scale the cliff after the surviving Yadav, and that both men engaged the enemy in ferocious hand-to-hand combat. During an interview from his hospital bed, Yadav was asked to comment on rumors he was planning on taking an exam to become an officer. Yadav responded that he would like to, but had to pass his high-school exams first… Once again, he was just 19 years old. This is really good post. It was shocking to for the wife to know of bad news circulating of her husband’s demise. Salute to the brave soldier of Indian Army. This message is for Smallwood, regarding research on army regimental show as he wrote an article on Param Vir Chakra winner Yogendra Singh Yadav . I need to get in touch with him. Please revert back as soon as possible.